Fishpond and RIO Products have announced their collaboration on creating the Headgate Tippet Holder. 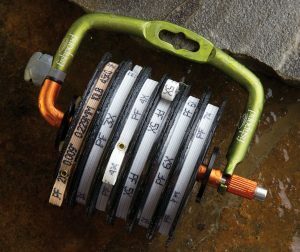 The Headgate is made from anodized aerospace aluminum with a built-in line cutter and holds five RIO Powerflex tippet spools. IDAHO FALLS, Idaho (March 27 2017) – RIO Products, manufacturer of fly line, leader, and tippet, partners with Fishpond, maker of fly fishing and outdoor adventure gear, to create the Headgate Tippet Holder loaded with five RIO Powerflex tippet spools. The updated Headgate, designed and manufactured by Fishpond, will come in RIO-inspired colors and with 2X-6X Powerflex tippet spools. The Headgate is made from anodized aerospace aluminum with a built-in, replaceable line cutter. The secure spring opens easily to slide spools on and rubber washers hold the spools in place. RIO’s Powerflex Tippet is made from co-polymer PTFE coating and its light grey color increases its camouflage on the water. With 30-yard spools of 2X, 3X, 4X, 5X, and 6X, the loaded Headgate is ready for any trout fishing situation. The RIO Fishpond Headgate Tippet Holder will be available this month for a retail price of $39.95, meaning one spool of tippet is free through this collaboration. Fishpond is a worldwide brand of products designed and manufactured for fishing and outdoor enthusiasts. Fishpond was created with the philosophy that innovation, design and a responsibility towards the environment from which we draw our inspiration is critical to our success. For more information, visitwww.fishpondusa.com. Connect with us via Facebook and Instagram.